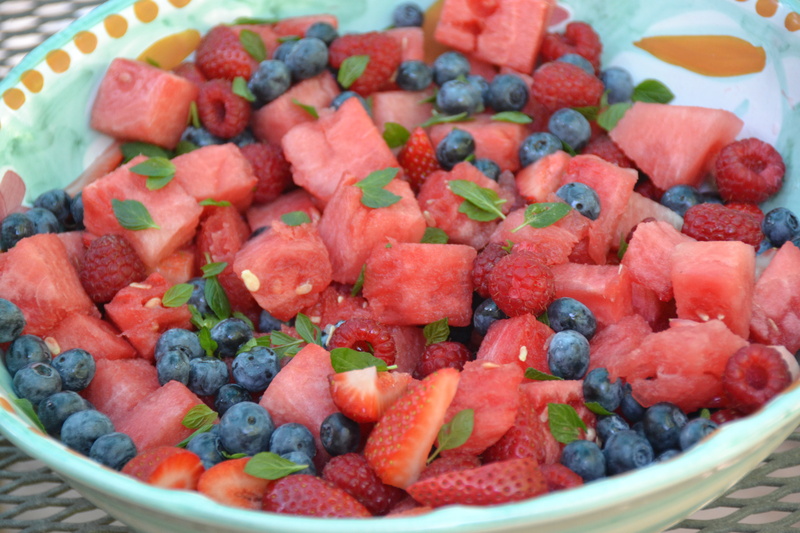 Some friends invited us to a cookout yesterday which was the perfect opportunity to bring one of my favorite fruit salads, a bright combination of berries, watermelon, lime juice and fresh mint. I like this one because it is pretty easy to put together, the only hands-on time required is to cut the strawberries and watermelonl. The combination of mint and lime is so refreshing in the heat, reminiscent of one of my favorites summer cocktails: the mojito. In fact, adding some rum to the lime juice before pouring over the salad would be great if you’re having a grown-up BBQ this July 4. This recipe is number twenty-seven in my countdown of thirty recipes to make for your Fourth of July cookout. Only three more to go and you can find all the previous ones here.